Natural History filmer and director of “David Attenborough’s Light on Earth”, Joe Loncraine provides some personal insights into fulfilling a lifelong dream: working with Sir David Attenborough. As a young man growing up in the UK with dreams of working in wildlife television, the ultimate goal is to work with Sir David Attenborough. However, once I had started working in the business, this experience seemed extremely unlikely; David was nearly eighty and was doing less and less work in front of the camera. That all changed years later, when after surgery to replace his knees David was suddenly back on our screens, and I was asked by cameraman Martin Dohrn to work with him on this project – a veritable dream come true. I had been told that David was still full of energy, despite now approaching his 90th birthday, and not wanting to simply sit David in a museum or behind a desk, as he has been seen on several programmes of late, Martin and I decided to get David out in the field as much as possible. Having said that, we were nervous and didn’t know how far we could push it. In the end, I think we were all positively shocked by how much David was still willing to get his hands dirty. David’s energy and enthusiasm made me believe more than ever that age really is just a number and no longer reflects one’s abilities or attitudes to life. We filmed with David in near total darkness in the forests of Pennsylvania at midnight. We made him walk down muddy tracks in the dark and scramble up riverbanks. He was lying in a damp field in France, digging up worms from the ground at 10 o’clock at night. And throughout the filming, he never stopped attempting to help the crew by carrying heavy pieces of film equipment. 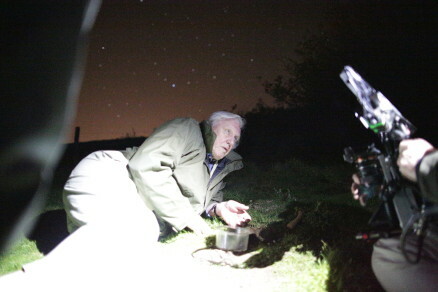 Sir David Attenborough, giving his uttermost to fulfill production needs. 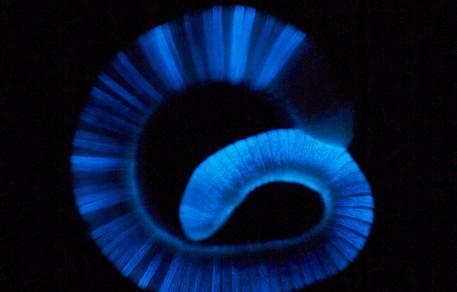 Glowing worms in France. Working with David was a privilege, because he is a genius storyteller. His ability to transfer his enthusiasm for the natural world is second to none. But also, thanks to this programme about bioluminescence, I got to work with another great of Natural History film: Martin Dohrn is the only person I know who can actually take a camera apart and when he puts it back together, it will work better than when it left the manufacturer. While his camera equipment is often made more of black tack and gaffer tape than it is actually from electronics, he is able to push equipment to its limits and get results where few could. So, with David and Martin we had a formidable team, and together I hope we have delivered something really extraordinary and special. Watch the trailer with never-before-seen images directly from the (glowing) dark in David Attenborough’s Light on Earth.